Professor Edgar Choueiri, is a professor of applied physics at the Mechanical and Aerospace Engineering Department of Princeton University, and Associated Faculty at the Department of Astrophysical Sciences, Program in Plasma Physics. He is also Director of Princeton University’s Engineering Physics Program and Chief Scientist at the university’s Electric Propulsion and Plasma Dynamics Lab, a recognized center of excellence in research in the field of advanced spacecraft propulsion. 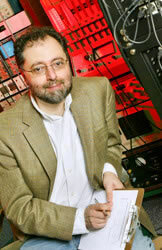 He is also the director of Princeton’s 3D Audio and Applied Acoustics (3D3A) Lab. Professor Choueiri is a world-renowned leader in the field of plasma physics and plasma propulsion for spacecraft. He is the author of more than 150 scientific publications, and encyclopedia articles on plasma rockets, plasma physics, instabilities and turbulence in collisional plasmas, plasma accelerator modeling, space physics and applied mathematics. He has been the Principle Investigator (PI) ion more than 30 competitively selected research projects (including two space experiments), funded by NASA, the US Air Force, the National Science Foundation, and other governmental and private institutions. He is Fellow of the American Institute of Aeronautics and Astronautics and the recipient of many awards and honors including a knighthood. An avid audiophile, acoustician and classical music recordist, his decades-long passion for perfecting the realism of music reproduction has led him to work on the the difficult fundamental problem of designing advanced digital filters that allow the natural 3D audio to be extracted from stereo sound played through two loudspeakers, without adding any spectral coloration to the sound (i.e. without changing its tonal character). He was able to solve this problem mathematically by applying analytical and mathematical tools he uses in his plasma physics research.